While you might spend plenty of time researching models of budget RTA cabinets, you may not work so hard on deciding the color. Color is an incredibly important aspect of your overall design plan, but some colors and styles tend to be preferred over others. While polka dot isn’t a common choice, the colors below are in millions of kitchens all over the world. White is a bright color that reflects light well and can add brightness to a room. If your kitchen has a lot of natural sunlight, then this color can amplify it during a bright and sunny day. It’s also known to blend in and go with many different decors. It’s perfect for a country theme thanks to its reflection of natural light. These elegant kitchen cabinets do have one drawback. Any kind of dirt or stain shows up on them like a beacon in the night. 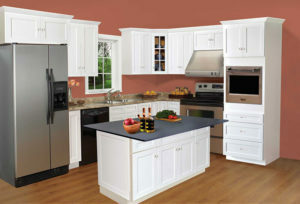 If you want white kitchen cabinets, then you’ll need to clean them regularly and whenever spills happen. A spaghetti sauce stain will stick out on a white cabinet or countertop. On the other end of the spectrum, we have black cabinets that still look stylish, but absorb rather than reflect light. If you have dark kitchen cabinets, they are going to give the kitchen a more romantic or mysterious feel. If you don’t want that, then create diversity with a white floor and wall combination. It will cause the cabinets to have a striking visual difference and become the focal point of the room. One of the advantages of black cabinets is they hide dirt and dust well. You won’t have to wipe them down as often, but you still have to take care of spills. Whether you choose a natural wood cabinet or something with a wood veneer, there is something beautiful and classic about the look. The best looking are the natural wood cabinets that are stained and have a nice gloss to them. There are many different types of wood available from cherry to oak, and each one has a unique flavor that will enhance the look of your kitchen cabinet shelves. If you want something that goes great with a country feel, then wood is always a safe bet, and with various stains you can get a variety of colors. If you want something to go with a more modern style, then go after a darker wood with a dark stain. Check out our wide variety of colors and when you’re ready to begin choosing cabinets, learn all about the process with our free guide.